Earlier this year, I spoke at a panel discussion in New York City to mark the unveiling of Quebec—an enormous 9’ by 10’ painting that aspires to capture the full sweep of French Canadian history on one canvas, from Samuel de Champlain to the modern age of indigenous activism. The American artist, Adam Miller, grew up in the Pacific northwest, and studied the great masters in Florence. The evening’s featured speaker was Donald Kuspit, an eminent Jewish art critic who briefly lived in Quebec, but otherwise has little connection to the largely Catholic society of French Canada. He described Quebec as a luminous postmodern take on the Baroque—a style that took definitive expression in the works of Flemish artist Peter Paul Rubens—and praised Miller for channelling influences adapted from the book of Genesis, imagery of the dead Christ, and Sandro Botticelli’s 15th century masterpiece, Adoration of the Magi. Which is to say, Quebec is very much part of that great cultural mash-up we call Western culture. And if Miller—who does not speak French—had engaged in an act of cultural appropriation, no one, including the Italian-Québécois business magnate who commissioned the work, seemed much put out by it. As a native Quebecer, I was impressed not only by the quality of Quebec, but also by Miller’s sheer nerve and astonishing, inventive juxtapositions. 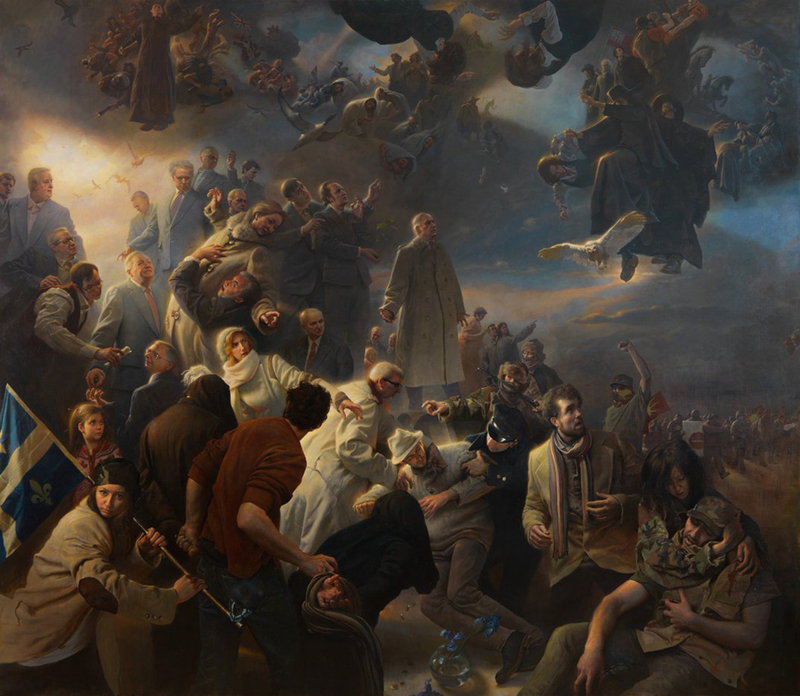 Decisions about what scenes or characters to include in an epic work such as this might have paralyzed a Canadian artist, as it is always difficult to view one’s own society clearly from within. As Quebec shows, it isn’t just the artist who benefits from cultural appropriation, but also his or her audience—since the cross-fertilization of ideas and attitudes helps a society remain vibrant and self-aware. As an artistic universalist (the term is not in common currency, but I would like to help change that), I’ve kept faith that the creative class would resist these trends, if only out of self-interest. Every year, my family decamps from Toronto to the LGBT-friendly beach town of Ogunquit, Maine, which acts as a seasonal melting pot for Boston-area academics, French Canadian sun worshippers, summer stock actors, and amateur artists. Ogunquit’s minuscule downtown manages to support an ecosystem of cabaret. On any given night, one might see 30-something men of various skin hues overlaying Yiddish or Russian lyrics onto samba-inflected cover versions of Elton John standards. Among this crowd, cultural appropriation isn’t seen as a vice. It’s a participation sport. But how long can this free-for-all last? In a widely-circulated 2016 article about the climate at Oberlin, New Yorker author Nathan Heller noted that identity acts as a sort of vice grip on many students. “[They] believe that their gender, their ethnicity, their race, whatever, gives them a sort of privileged knowledge—a community-based knowledge—that other groups don’t have,” he wrote. One Comparative American Studies professor whom Heller cites became so alarmed by students’ physical and ideological self-segregation that she canceled her class mid-semester in favour of independent study, since there was no meaningful interaction in the classroom. When these students grow up, buy Audis, and come to Ogunquit, will they dare croon Yellow Brick Road in anything but the Queen’s English? If Americans and Europeans are curious how all this ends, they might take a look at Canada, where the war against cultural appropriation is in a decidedly more advanced phase. This year, in fact, it has become the subject of full-blown social panic among the country’s intellectual class. Our experience demonstrates that the real issue isn’t whether one group may borrow ideas and imagery from another. It goes further—to the very definition of culture itself, which we long have taken for granted as, in Matthew Arnold’s words, “a free and fresh stream of thought” that endlessly reinvents itself so as to represent “the best which has been thought and said in the world.” The more defensive mindset that has been embraced by my country’s intelligentsia instead casts culture as a series of compartments—like an egg carton—each allowing right of entry not on the basis of genius or genre, but biology and birthright. By way of example, compare Adam Miller’s vernissage in New York City with that of white Canadian painter Amanda PL, whose work was influenced by the bright colourful style of celebrated Anishinaabe artist Norval Morrisseau (who himself seemed to reflect the influence of European stained glass artists such as Sergio de Castro). When a Toronto gallery was pressured to cancel a recent Amanda PL exhibition on grounds of cultural appropriation, some compared her ordeal to that of white American artist Dana Schutz, whose painting depicting the encoffined body of Emmett Till appeared in the Whitney Biennial. But there’s an important difference: Schultz’s painting remained on view. Amanda PL’s gallery, on the other hand, folded without a fight. It gets worse. An organization that one might hope would be leading the fight for free speech—The Writers Union of Canada (TWUC), which claims to represent the interests of published authors—went all in on the side of DNA-based censorship. In May, when the editor of TWUC’s in-house magazine, Hal Niedzviecki, wrote a satirical editorial encouraging Canadian writers to reach outside their own narrow cultural silos, he was pilloried, humiliated and forced to step down. At the time, I served as editor of a leftist arts-and-letters monthly, and wrote an opinion piece protesting Niedzviecki’s treatment, while casting cultural appropriation as a subject that should be the subject of good-faith debate. Even that opinion is now taboo, I discovered. I, too, was attacked, including by some of my own colleagues. When I later resigned, many Canadian journalists initially assumed that this controversy had been one of the factors in my decision—and understandably so. In the wake of all this, The New York Times and The Economist came to my defence, and cited my travails as an example of hypersensitivity gone amok. Which I suppose it was. But these experiences, and the discussions they produced, also gave me an opportunity to experience the anger and sense of moral purpose coming from the other side. In all Western societies, there now is a relentless emphasis on the collective psychic pain experienced by minority communities, which means that the call for race-based censorship likely will get even stronger in coming years. My experience taught me that the battle for cultural universalism cannot be won merely with slogans and clever quotations from George Orwell. To prevail, cultural universalists will have to accommodate their arguments to the sense of injustice that animates the censors’ demands, and in so doing make allies out of critics. It’s common to think of culture as akin to a sort of giant cloud drive—one that allows artists and writers to download, review and adapt the themes of others en route to creating their own uploads. And just as with Internet downloads, the integrity of the original data set remains intact. When Adam Miller tapped into Adoration of the Magi, he didn’t compromise Botticelli’s reputation or oeuvre. Just the opposite. By the traditional lights of Western culture, imitation—or, if you prefer, homage—is the sincerest form of flattery. But as these exchanges unfolded, it became clear that there was an important, unstated premise embedded within my analogy—which is that the moral meaning of the Holocaust and its place in history isn’t up for grabs. The same isn’t always true for other historical traumas. As a Jew, I can afford to treat the Shoah as cultural shareware because I know that my daughters read The Diary of Anne Frank in school, and that one of the most successful figures in the history of film made a movie called Schindler’s List. But my feelings might be different if I were living in a society where the Holocaust were widely unknown or, worse, denied. In that case, it really would matter if the next Primo Levi had genealogical skin in the game. For Canada’s indigenous peoples, these issues are especially wrenching because their societies generally have relied on the oral transmission of folklore and legends from generation to generation. There are over 600 First Nations groups in my country, each with distinct traditions. In many cases, their stories have never been comprehensively set down in print—in part because racist Canadian laws once suppressed the use of indigenous languages and cultural expression. Members of these communities are sensitive about letting an outsider create history’s first draft. “Indigenous lit,” as it is now called, is hot in Canada. Absent the stigma associated with cultural appropriation, there is nothing to stop an ambitious white writer from turning a chance conversation with an indigenous elder into a best-selling novel that garbles the tribe’s narratives, and perhaps even embarrasses the community. Given the way indigenous people have been depicted in grade-school textbooks and popular movies until quite recently, it isn’t hard to understand why these groups might be anxious and skeptical. [They were] said to capture wayward children, take them away from their families, and eat them. With their supernatural healing powers, the wild ones were thought to be invincible; only once was a wild person taken by angry villagers and burned alive. But to the mortals’ horror, the ashes began buzzing in a tiny chorus of little hu-hu-hu’s, and each particle sought out human flesh. This was the origin myth of mosquitos. Sasq’ets taught our children to stay out of the forests at night. It connected us to our part of the world, in the same way that Hansel and Gretel or Little Red Riding Hood connected Europeans to their ancient forests. As Jago notes, the idea of Sasq’ets was popularized in North America as “Bigfoot,” and became known to many of us not through high literature or documentary film, but rather the B-movie farce of Harry And The Hendersons. Many writers and artists I speak with tell me that we must “fight back” against the idea of cultural appropriation—just as principled liberals fought back against the first wave of political correctness in the late 1980s and early 1990s. I agree. Artists and intellectuals should be free to appropriate any idea they please, even at the risk of being rude or making members of other communities ill at ease. But as I hope the discussion above will show, the movement against cultural appropriation, unlike the resistance to early university speech codes, can’t be won in the dean’s office or the courts. The old debate was about where to draw the line on free speech, which is a matter of degree. The new debate is a matter of kind—for it goes to the very existential question of what culture is. Do we remain children of Arnold, who emphasize culture as a force for creative destruction that empowers the most brilliant artists in our midst and serves global audiences with an ever-swirling mix of mash-ups? Or do we honour a new definition that rigidly safeguards the dignity and traditions of groups that have long been disparaged, mocked and ignored? My own view is that cultural universalism will, in the end, prevail—because artists and authors of color themselves will eventually become exasperated by doctrines that limit the influence and reach of their literature, art and music. It is one thing for me to say that anyone should be allowed to quote from Irreplaceable. It will be quite another when Beyoncé says it. But those of us who have not won 22 Grammys, nor sold over 100-million solo albums, also have a role. For one thing, we must help demonstrate that the idea of cultural universalism is not a white creed. It equally honours the black writer who seeks to write about the plight of Syria’s refugees, or an African immigrant writer who becomes fascinated with the legacy of Ireland’s potato famine. At its root, the fear of cultural appropriation is fueled by the expectation—learned the hard way, from the racist monoculture of old—that white men like me simply can’t be trusted to produce art or literature that treats minority communities in a fair, respectful and intelligent way; and that we have created a closed-door literary club whose rules exist only for our own advantage. Such suspicions can’t be dispeled by slogan or manifesto. Rather, by our actions and gestures, we must show that a culture of free speech is in everyone’s best interests. Featured image is Quebec by Adam Miller. Used with permission. A nice thought. I’ll just take issue with one of the universals on the list. If we take jokes to mean actually funny ones, then it’s not a universal, as demonstrated by the Germans. And the critical theorists/postmodernists/sanctimonious shouty offence junkies. Would it? I think that while the nature of the work itself would matter more than currently, the skin color or ancestry of the author would still be irrelevant. To me the statement would only make sense through the indirect argument that such an author would be more likely to produce a good representation, but what matters is still just the quality of the work itself. Beautifully said. Thank you for this piece. You are absolutely correct; universalism cannot win over the egg carton by force of law. Even if it did, that would be repeating the mistakes of the past. Actions and gestures are the way to make friends out of enemies. I’m reminded of the man who deconverted dozens of KKK members, just by making friends with them as individuals in the guise of writing a book about the KKK. Him being African American became secondary to him being a person, and once that happened they realized how their own egg carton racism was so dangerous and wrong. Obviously the situations of power are reversed here, but the sentiment is very similar. Interesting piece. It seems unlikely to me that cultural universalism is possible when racial and wealth inequalities are what they are. When someone is better positioned to commodify cultural products, there will always be an outcry. Before reading the article, I wanted to express my appreciation for the incredible artwork in the article’s header. “My own view is that cultural universalism will, in the end, prevail” really? What sort of historical clue can you show us? What does cultural universalism even mean? “Which is to say, Quebec is very much part of that great cultural mash-up we call Western culture.” ahhahahahhhahahahhahh [breathe] ahahahahahahahaha. The paint…. Oh Ok, now I understand, no worries. Ignore my previous comments. If you read from Orwell’s less famous works, there’s plenty of anger at colonialism, industrialism and inequality. It’s one of his main focus points. I’m broadly in sympathy with this article, but I’m not sure I observe any ‘new definition’ in effect. Novel usages of ‘culture’ do spring up – one count claimed to identify 164 separate ones – but talk of a plurality of cultures is typically traced back to Herder. It hasn’t always underlain the same moralisms, though.